Members of the Legacy Christian Academy Knights boys high school basketball team, the 2018-‘19 Metro Buckeye Conference champions. LCA senior Erik Uszynski makes two defenders miss and scores the easy jump shot in close, during Friday’s Feb. 8 game at Legacy Christian Academy, in Xenia. 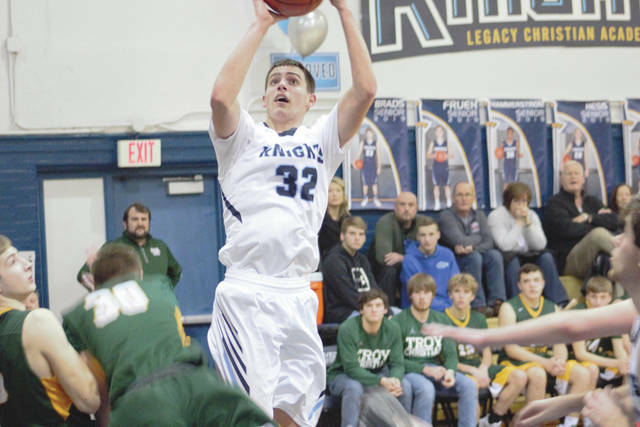 Uszynski scored 17 points in the Knights’ first league regular season championship in school history. XENIA—The journey to become a conference champion can be a long one. 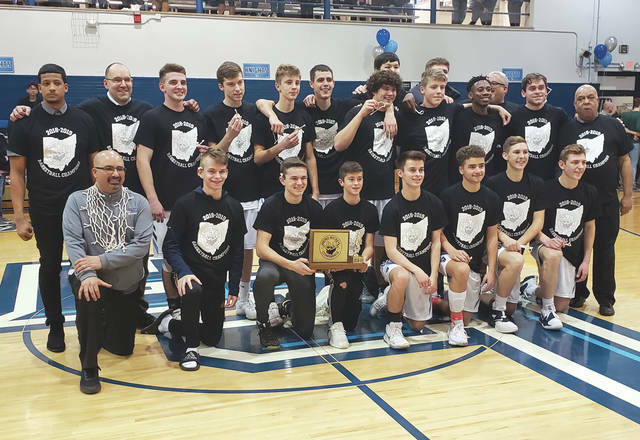 However, the Legacy Christian Academy Knights boys high school basketball team won its first Metro Buckeye Conference title by a score of 50-42 over last year’s champion the Troy Christian Eagles. LCA senior Erik Uszynski said he never doubted it could happen. It was Senior Night so the crowd was pretty hyped to start the game, but LCA started off rough as it took them 5:31 to score their first basket. However, the team pulled through. By the end of the second quarter the team had taken their first lead and never gave it up. Uszynski led the team with 17 points and was able to break the 1,000 career point barrier in the game. Immediately after scoring the basket he sprinted to his dad and gave him a big hug. Uszynski said it was a great bonus, but that he really was much more concerned with winning the conference. Newsome said that the process was something they were constantly focusing on, to work towards this achievement. He mentioned how the school had been building this one brick at a time and it was great to see it all come together. Newsome said this first conference title for the boys should help set the program in the future. LCA achieved one of its biggest goals with the conference win. What a world of difference a four-year journey can make.